Admission for BS, MS, M.Phil and Ph.D have been started at PMAS Arid Agriculture University of Rawalpindi. The last date to apply is September 18,2017. Here you find every detail you need to apply. Just visit the university and get the Prospectus with admission form for Rs. 1000/- and you can also download the form form the university website along with Challan form amounting to Rs. 1000/-. Note: Minimum 45% Marks in last degree are required to submit application for admission in any program. 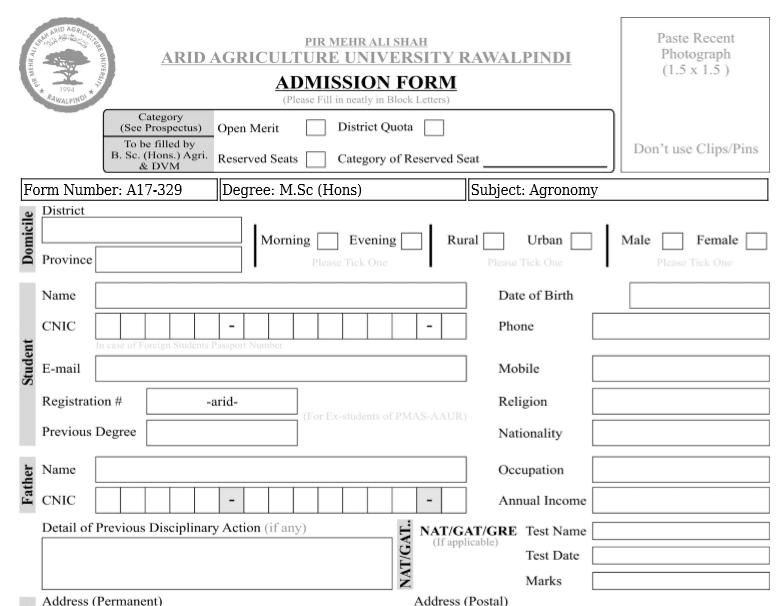 Admission form can be generated online from the official website of PMAS Arid Agriculture University of Rawalpindi. 4. Recent Passport Size Photographs. Selected candidates are required to produce original documents at the time of admission/enrollment. Q. What is the Last Date of Submission? The last date of admission for Arid university is 18 September, 2017. You can submit your application in office working hours(8:00 am to 5:00 PM, Mon to Fri). Fee for Ph.D/M.Sc (Hons.) - Agriculture Engineering is Rs. 1500/- and For B.Sc Agricultural Engineering is Rs. 1000/- and for all other undergraduate and postgraduate programs is Rs. 500/- . Candidate must have to pay at the time of submission of admission form on account of Entrance Test Fee. Q. What About Undergraduate University Entrance Test? There are some programs which need Entrance Test to be passed. Entrance Test for Undergraduate programs i.e B.Sc (Hons.) Agriculture Human Nutrition, Dietetics, BS(Biochemistry/Microbiology/Env. Sciences), Forestry, Geoinformatics, Dairy Technology, B.Sc Agriculture Engineering and DVM will be held on 21.9.2017 at 09:00 a.m.
Q. What About Postgraduate University Entrance Test? Entrance Test for postgraduate programs including M.Sc (Biology,Botany, Mathematics, Statistics, Zoology, Biochemistry) /M.Sc (Hons. )/ MS/M.Phil/Ph.D will be held on 21.9.2017 at 02:00 p.m. Applications, complete in all respects, accompanied by the academic credentials, domicile certificate, migration certificate, etc. must be submitted to the respective faculty/admission office within the due date. Online applications without original deposited Challan form will not be accepted. University Entrance Test is compulsory with 70% marks for admission in Ph.D. Qualifying University Entry Test shall be mandatory; however, merit will be determined only on the marks obtained in last degree/certificate except B.Sc Agriculture Engineering, MS, and M.Phil Programs. Candidates should apply separately for morning & evening programs. Morning application form shall not be considered for evening program and vice versa. Q. What are the Merit List Dates? 1st merit list will be displayed on September 25, 2017 and the 2nd merit list will be displayed on September 29,2017. Merit lists will be available on Notice board of each department and will also be available on website after 24 hours. There may be a possibility of more than two merit lists. those candidates who will be selected in 1st merit list, They must submit their dues before 28 September and candidates in 2nd merit list before 3 October. 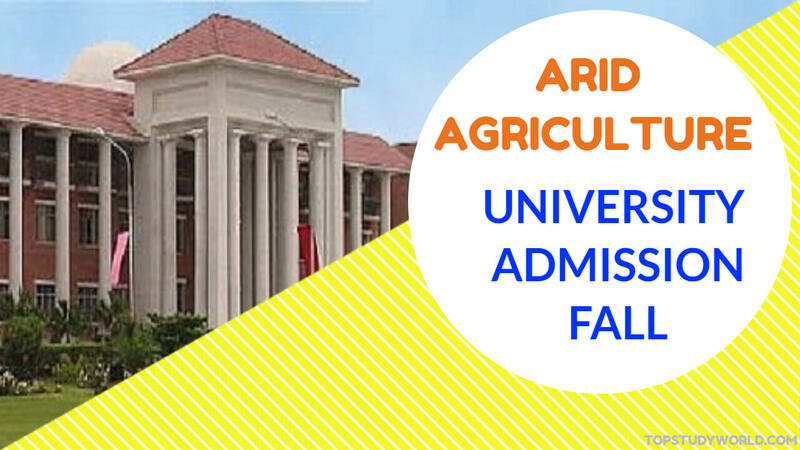 Are you looking for a guide how to apple for admission at Arid Agriculture University Rawalpindi Admission Fall 2017 for BS, MS, M. Phil or Ph.D programs then you have come to the right place.